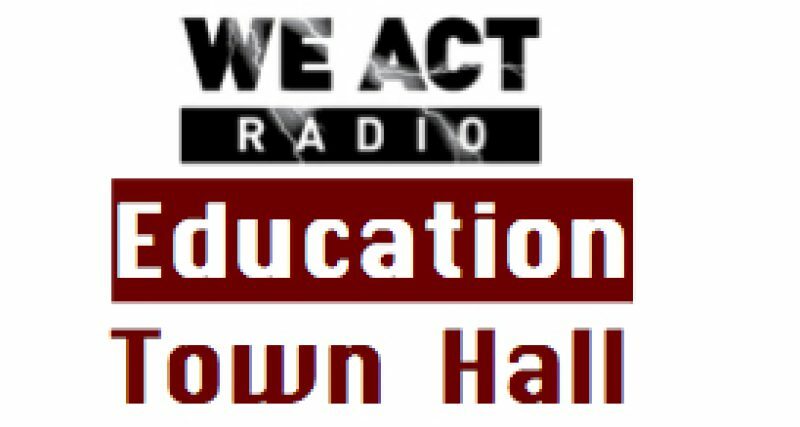 August 8 edition of The Education Town Hall experienced technical difficulties: The comments of Mr. Kenneth Ward were not always audible due to microphone problems during the first 19 minutes of the show. Here is a partial transcript of that portion of the conversation. Dr. David Cranford, Exceptional Education Management Corporation: helping to support schools serving the most in-need students in the District — including Options PCS and Booker T. Washington PCS…. One of the District initiatives is to return students from private placements, so working to improve access and increase the quality of those services. Dr. Simon Earle, Principal, Options PCS. Options’ primary focus is to provide an exceptional education for exceptional students. Options’ goal is to make sure that we’re providing students with special needs and students from general education the most rigorous educational experience possible… a robust vocational, academic program, athletic programs… so, any student…welcome, but we cater to students with special needs, particularly those with emotional disabilities… students who have not been successful…graduate on time with a diploma. Mr. Kenneth Ward, Vice Principal of Booker T. Washington Public Charter School for Technical Arts: At Booker T. Washington Public Charter School our mission, laid out for us by our founder and director, is that we take students who have not been successful in other public schools and give them vocational training and access to trades, such as drafting. Thomas Byrd, host: What would you say are biggest issues facing special needs students today? For me as a teacher, and now a principal — I think the biggest issue for students with special needs in general, not only in the District of Columbia, is access to an appropriate educational program. A lot of times when students have disabilities they’re thought of “less than” or “not able to compete.” When such a label is assigned to a student, it automatically decreases the chance for that student to succeed and graduate on time. I think the one of the biggest issues… in the District and nationally is that we should not have a cookie-cutter approach. There’s a reason why students have an Individualized Education Plan. We need to commit to educate them through the IEP and provide the resources that they need. Students that have special needs learn. I think if we start there — they might not learn like students in general education learn. They may use different modalities, but they can retain the information they need to graduate on time with a high school diploma. Byrd: what is your organization doing to address these challenges? Increasing access to services for students. I’ve been in the special education field for 15 years in the District of Columbia….for students having the most significant disabilities and the most at-risk factors, there simply aren’t enough programs… and I question the quality of some. [High stakes testing] makes it a challenge for schools to meet those targets…school systems are discouraged from taking students with the most disabilities. There has to be less of a cookie cutter approach, as Mr. Ward said…we need to look at different outcomes… need to look at the whole child, including social and emotional support. Access to programs, including vocational programs that are going to help them [after graduation], such as those offered at Options and at Booker T. Washington. EEMC is an unusual management company in that our focus is on special ed and health. Many of our students may be overage, they’ve had experience with “zero tolerance” and so have disengaged. But EEMC works to ensure that the District can serve these children and not pay for these private placements and send children off to places outside their communities. EEMC has contracts with 16 charter schools — help in providing access to additional services, including mental health. In the District, 5% of students are medicaid eligible, so we’re trying to improve their access to mental health and other services, we’re helping schools get access and funding that comes with it. Our schools provide licensed clinical psychologists and school psychologists, social workers, special education coordinators. [In class and behavioral support.] Also transition support to post-secondary, technical centers or into the work force — we offer multiple layers of support, meeting the needs of the whole child and meeting their IEP and goals and objectives of IEP….to provide an appropriate education and leave students prepared for 21st Century. We have what we call wrap-around services. And those include clinical social workers, psychologists on staff… We look at the whole child. When a child comes in to Booker T. Washington, our job is to get them from 9th grade to graduation, and to either attend college or earn a living wage… including trades. We tell all of our freshman if they have special needs, there’s someone in the building they can go to. Instead of getting kids who haven’t been successful and doing the same thing that was done to them in a previous placement, we take that child and try to bring that child up with all the services they need to be adults. Students with electrical, carpentry, drafting apprenticeships are in a better position [to land a job] than some other 18-year-olds. Starting at 19:00, the remainder of the August 8 archive recording is without serious microphone problems.